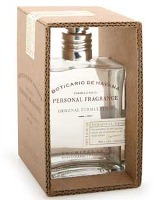 Boticario de Havana (shown) ~ "A truly intoxicating fragrance: tobacco flower, orange blossom, patchouli and honeysuckle with clean and citrusy top notes of bergamot. Suitable for both men and women." In Eau de Toilette, 53 ml for $35. Milk Eau de Toilette ~ "A lovely, clean combination of our bestselling oat and soy milk fragrances in a natural body spray that showers the skin." $30 for 50 ml. Archipelago makes some really nice candles, but I’ve never tried their fragrances. I’ll sniff em if I see em. So far, there are only 2 others: Pomegranate and Grapefruit. I haven’t tried them either. The Havana one sounds nice – but I’m a sucker for all of those notes, so that’s not surprising. It does sound nice. I’d be curious to smell both. It does sound nice. It’s an odd picture though…why the cardboard box? I love “milk” body products – L’Occitane, H20, Burt’s Bees. The scent is so soft and clean and soothing. It makes me curious to check out this new scent. And the Havana doesn’t sound half bad either! They have that scent in a gajillion other products too. I’m a huge fan of milk as a fragrance at least in the products I’ve tried, so this looks intriguing. Oh, and Boticario de Havana looks really refreshing and pretty as well, especially with spring just around the corner. The prices are really reasonable, too. It’s generally a reasonably priced brand. i have used some of their milk scented lotions and soaps. i love the way they smell. they make me feel very calm and relaxed, like i have been at a spa!